Now that you have heard my speech lets get to this recipe! 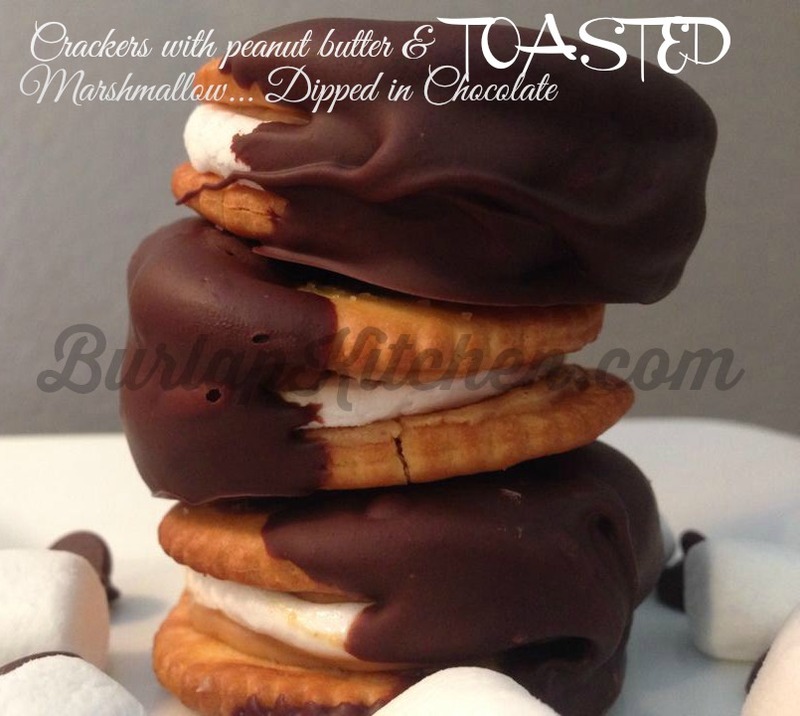 * Recipe is for 16 crackers with peanut butter and TOASTED marshmallow dipped in chocolate…Depending on the brand of crackers you use, 1 sleeve will make about 16 of these. 1.) Spread all 32 crackers with peanut butter, set 16 aside and place the other 16 peanut butter side up on a cookie sheet that has been lined with tin foil. 2.) Cut all 8 marshmallows in half and place one on top of the 16 peanut butter spread crackers on the cookie sheet. 4.) 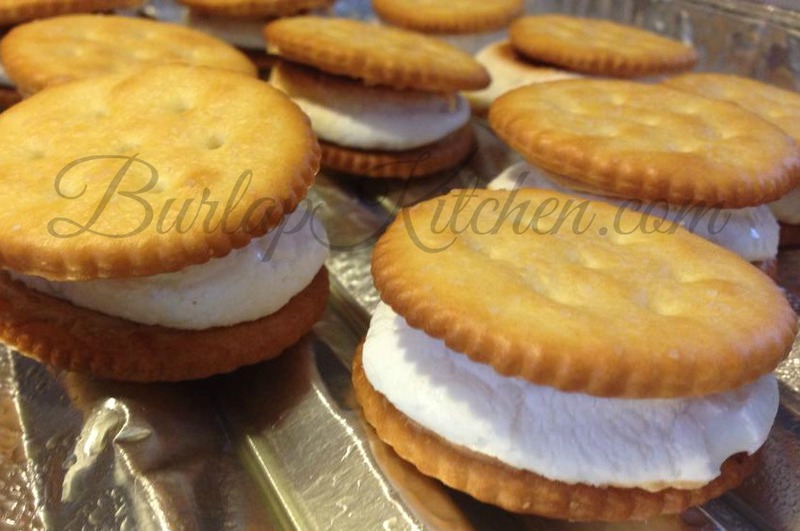 As soon as they come out of the oven take the crackers that have been spread with peanut butter and set aside, and place one on top of each marshmallow. 5.) Set them in the fridge for about 10 – 15 minutes. 6.) Melt chocolate in a microwave safe bowl ( I add a few drops of veg. oil to it). When melting the chocolate only microwave for 30 seconds at a time stirring each time till chocolate is melted. 8.) 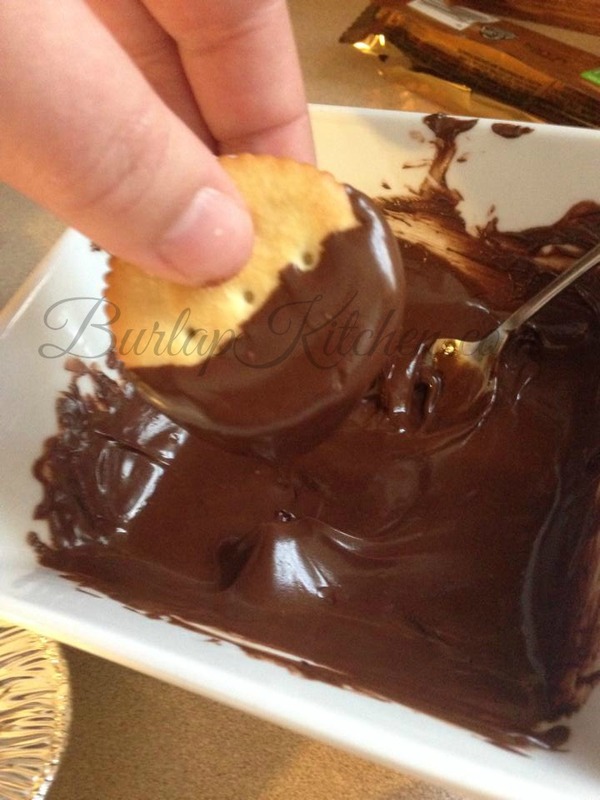 Dip the crackers in chocolate one at a time and line them onto the cookie sheet you lined with wax paper. 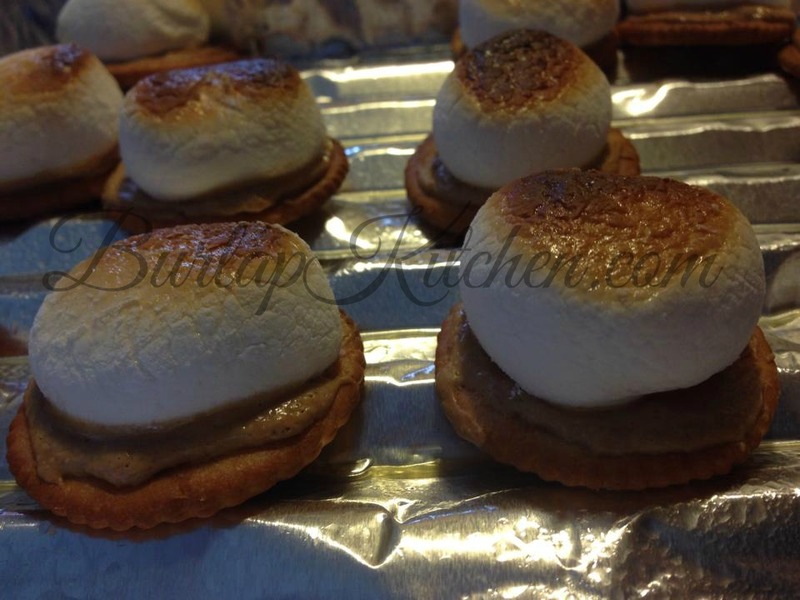 Crackers with Peanut Butter & TOASTED Marshmallow... Dipped in Chocolate! Crackers that have been spread with peanut butter with a toasted marshmallow in the middle and then dipped in chocolate. 1.) 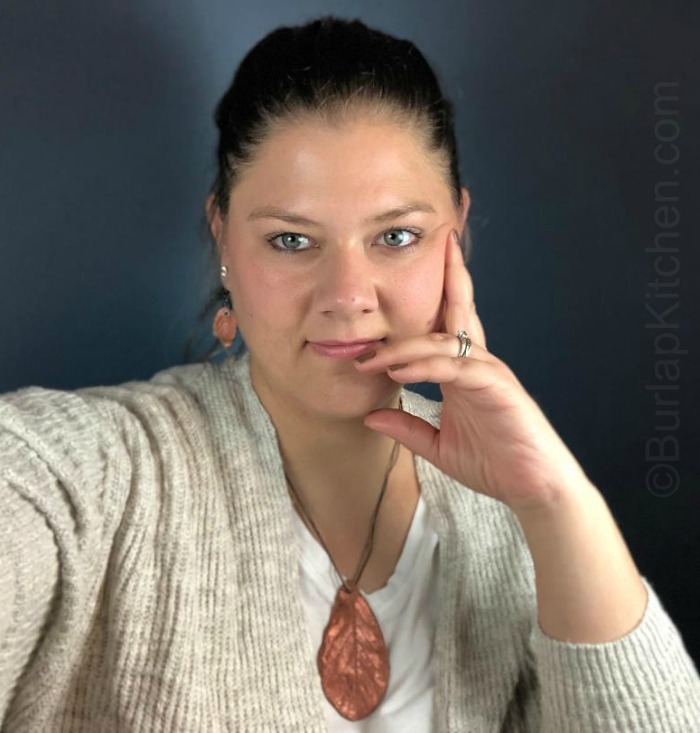 Spread all 32 crackers with peanut butter, set 16 aside and place the other 16 peanut butter side up on a cookie sheet that has been lined with tin foil. 2.) Cut all 8 marshmallows in half and place one on top of the 16 peanut butter spread crackers on the cookie sheet. 3.) Set your oven to Broil and put the crackers in. DO NOT WALK AWAY! Watch them till they get nice and golden brown.. I like mine a little on the burnt side. 4.) 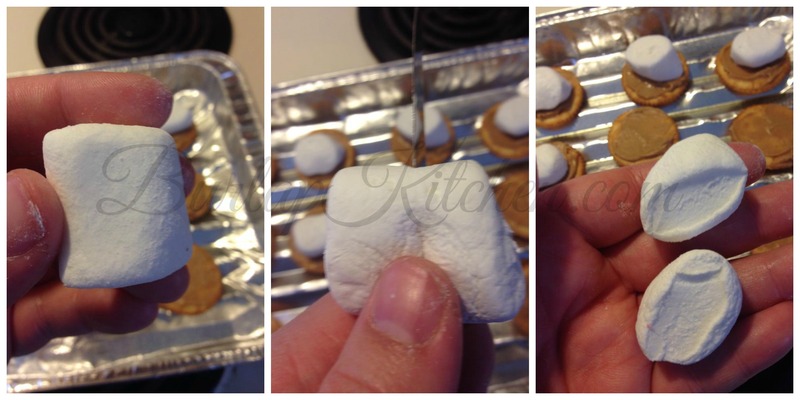 As soon as they come out of the oven take the crackers that have been spread with peanut butter and set aside, and place one on top of each marshmallow. 5.) Set them in the fridge for about 10 - 15 minutes. 6.) Melt chocolate in a microwave safe bowl ( I add a few drops of veg. oil to it). When melting the chocolate only microwave for 30 seconds at a time stirring each time till chocolate is melted. 7.) Take the foil off of the cookie sheet you used to toast the marshmallows and line it with wax paper ( doing it this way saves a dish!) 8.) Dip the crackers in chocolate one at a time and line them onto the cookie sheet you lined with wax paper. 9.) Refrigerate until chocolate is firm 10.) Enjoy!